There are quite a few fabulous costumes made from—you guessed it, paper! Whether you are looking for inspiration for a Halloween costume for yourself or your kids you will find some great tips and ideas in the following list. 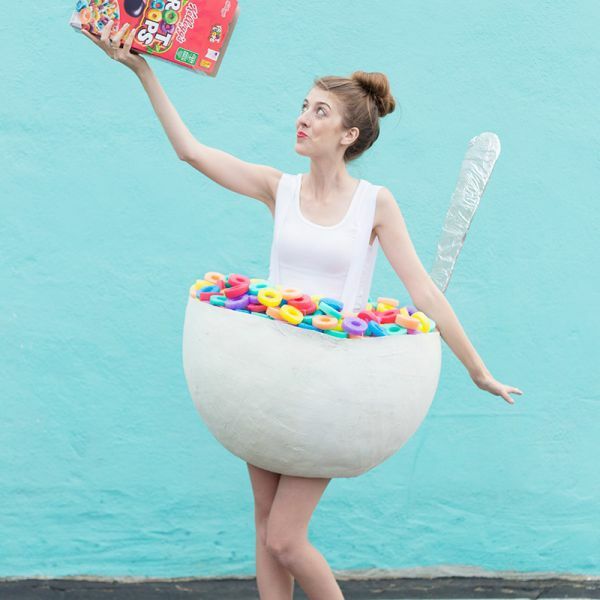 Be the envy of all your friends with the cutest costume ever! Are you looking for a Halloween costume that is fun, quirky and adventurous? You will love this unusual design from Kelly Mindell at studiodiy.com. Surprise your friends and show up like a bowl of Fruit Loops Cereal at the next Halloween party. Learn how to make the paper mache bowl and spoon along with giant-sized cereal, it isn't as hard as you think! The fruit loops are made from an unusual material; pool noodles! Who would have guessed? Kelly has designed outfits for Miley Cyrus, and her unique sense of style shows up in her kooky one of a kind crafts. The Royals in Great Britain are fascinated with fascinators! Make a paper hat this Halloween from playing cards and pretend you are the Queen of Hearts. Loula Belle from trickylittlecorset.com has an easy to follow tutorial that will show you how to make this fancy hat. This teacup paper fascinator can be crafted quickly and costs almost nothing to produce. Strut your stuff as proudly as any one of the British royals! It seems that almost every little girl goes through a ballerina phase. Make this delicate butterfly headpiece to go along with a store-bought tulle tutu costume.A sweet ballerina is a perfect costume for those of you that have girly girls as daughters! This costume is perfect for moms short on time but still wanting to add a handmade touch to their daughters Halloween costume. Every kid goes through a dinosaur phase! Your child will be the envy of the preschool set with this paper mache dinosaur head (a T-Rex) costume. The base of the head is a construction helmet which ensures comfort when wearing the costume. Easy step by step instruction is provided in the tutorial, with photos galore so that the project can be considered almost foolproof. We all love that! Marie Antoinette was an eighteenth-century French queen that many people attribute the saying "Let them eat cake" to. She apparently showed no empathy for the plight of starving French peasants. This matter may or may not be true, historians just aren't quite sure, but it is still fun to pretend to be Marie Antoinette. If you have ever desired to be a French queen you can be one this Halloween. Brittany Watson Jepsen from thehousethatlarsbuilt.com will show you how. She has a fantastic tutorial that teaches how to make a paper wig and some useful makeup tips. Add an awesome dress to the mix and you too can be "Queen for a day." Who says you can't have Haute Couture for your Halloween outfit? Lia Griffith, the queen of paper crafting, inspires us with her beautiful dresses from crepe paper. If you know how to sew, you could replace fabric and thread with crepe paper and a hot glue gun. These dresses could work well as the base for a fairy, witch or queen costume. Make the dress in black with lots of sparkles for a witch, in pink with glitter for a fairy or in any other color with silver sequins for the queen costume. Add the appropriate hat, crown or fairy wand and you are ready to go! Be willing to stand back and receive the compliments as people admire your paper "designer" Halloween outfit. Amy from delineateyourdwelling.com designed these scuba diver costumes for her children last year and said they loved their costumes so much that they continued to wear them even after Halloween. They liked to pretend they were divers all year long! Another plus for this costume is that it is very cheap to make! Who doesn't love saving money? This Halloween outfit is guaranteed to have your kids go into cuteness overload! Halloween is all about spookiness, and this octopus does look a tad scary! Although this paper mache craft is not technically a costume but rather a home decoration it could be adapted into a costume if you wanted it. Just imagine how much fun it will be to watch your unsuspecting trick or treaters stumble upon the creepy octopus on your porch and get scared! Now that is pure Halloween fun! Angel wings are a relatively straightforward homemade Halloween costume to construct. Make the wings, attach them to your back and you are ready to go. Clau from clobyclau.com demonstrates just how easy this costume is to make. The tutorial is in English and Spanish. Heavenly! Many people wait until the last minute to prepare for Halloween. Although you will have a better costume if you start early, you still can come up with some cute ideas. Why not be a wind-up doll? All you have to do is wear your regular clothes and attach a paper mache key to your back. How simple is that? You just need some cardboard, a paper tube and a couple of other items that most people have in their homes. Easy peasy! Are you on the artistic side? Then you may want the challenge of constructing some beautiful cardboard butterfly wings for your little one. Although there is no tutorial, just a photo for this project, those of you that are handy could probably come up with a similar version. It could be constructed with simple paint and cardboard. Use the photo as inspiration and see just how beautiful your butterfly wings can be. Are you the mom that wants to make homemade costumes for your kids at Halloween but just don't have the time for complicated projects in your busy life? Then these darling paper plate animal masks might just be for you. The cutest fox, bear, bunny, monster, and dinosaur face paper plate masks can be whipped up in no time. Your little ones will look so adorable wearing their masks and pretending they are the animal the mask represents. Be sure to photograph your toddlers in the costume; this will be a memory you will want to keep! This flower hydrangea headpiece is adorable. A single massive beautiful hydrangea is constructed from crepe paper and made into a headpiece for a child. Your kids are guaranteed to look extra sweet when wearing this paper flower costume.Add some crepe paper leaves for cuteness overload! Tiffanie Turner of bloggingcornerblog.blogspot.com sells paper beauties in her Etsy shop and has generously shared a tutorial so that we too can make these gorgeous floral headpieces for our children's ballet recitals, Halloween, etc. Thank you, Tiffanie! This costume item is truly a last minute special Take a piece of paper, fold it using origami techniques demonstrated in the tutorial. Then carefully glue a red card stock cross to the front of the nurse's cap and you are done! It does not get any easier than that! You might want to add a stethoscope to the costume to finish the ensemble! Show your love of coffee and dress as a cup of Starbucks Frappuccino this year for Halloween. Caitlyn from Southern Curls & Pearls has designed a costume she says takes fewer than 2 hours to construct, and the materials cost less than $40. The costume is cute, unique and very feminine! Who would have thought a cup of coffee could look this good?